This trick can be very useful if you are carrying a bunch of stuff and your arms are full. Plus it’s kind of cool. As well as the ever-present clicker and treats, you will need your target. the Door Start by reviewing the target with your dog. Just place it down, give her your target cue, and reward her when she goes to it a few times. Once her memory has been refreshed, you can move on. 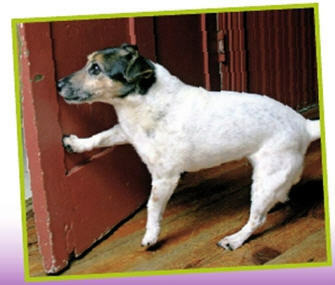 Find a door that swings fairly easily on its hinges (it isn’t fair to start your dog on a sticky door). Position yourself so that the door closes by pushing it away from you. You may also want to choose a door that isn’t used regularly by the rest of your family so you and your dog won’t be interrupted. Since your dog already knows how to use the target, tape it to the closed door at about her head height. Close the door and then give her your cue for the target. When she touches the target, click and treat. Repeat several times. When your dog is touching the target consistently, you can open the door a few inches. At ﬁrst require her to move the door only a little when she touches it. As soon as it moves, click and treat. It may take a while before your dog gets excited enough to shove the door, so be patient. Once she is regularly moving the door when she touches it, you can start reinforcing her only if she pushes the door hard enough for it to close. At this point, you can change your cue word to something that specifically means “shut the door.” Something like “close” is best because it’s easy to remember. From there you can gradually increase the amount you open the door until your dog can close it when it is open all the way.